Where does the energy required to drive electrons through the external circuit and power up devices (like a light bulb) come from? 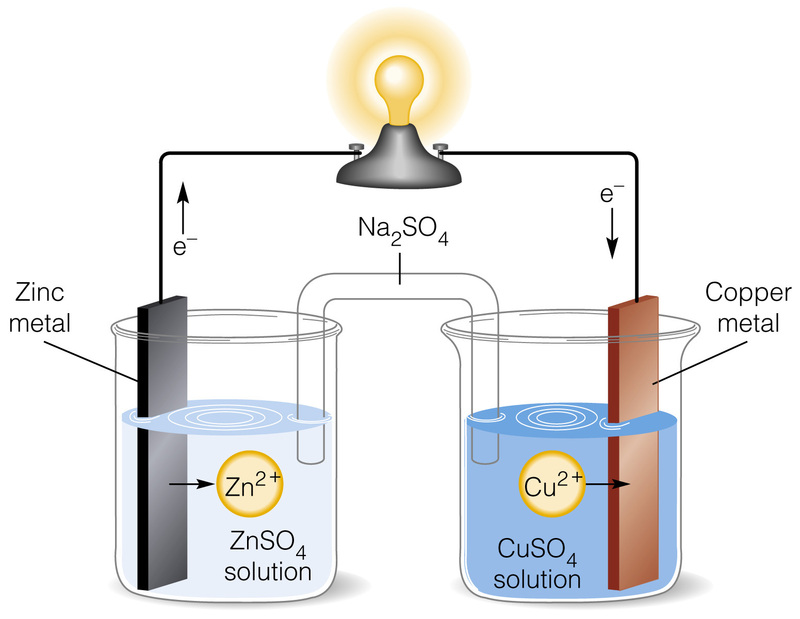 Does the oxidation of zinc release that energy? And, does the reduction of copper result in more energy being released? (since we're calculating the cell potential by adding up the oxidation and reduction potentials of the two half cells). I've always wondered about this question, and I'd really appreciate a clear and concise explanation regarding this particular topic. Judging by your above comment to beginner's answer, you seem to be confused about how reactions proceed in general. The oxidation in the beginning certainly requires energy, but at the end of the reaction, the system ends up at a lower energy state overall. This causes the reaction to be "spontaneous". The cell is an electrochemical cell that derives electrical energy from spontaneous redox reactions taking place within the cell. In other words, the metal atoms of one half-cell are able to induce reduction of the metal cations of the other half-cell; conversely stated, the metal cations of one half-cell are able to oxidize the metal atoms of the other half-cell. When metal B has a greater electronegativity than metal A, then metal B tends to steal electrons from metal A (that is, metal B tends to oxidize metal A), thus favoring one direction of the respective reaction. Why are non-spontaneous reactions driven in the presence of energy?